Whether you’re a New England Patriots fanatic or cheering for the Los Angeles Rams, most people can agree that snacks are a quintessential part of a great game day. The football championship is the second biggest day for food consumption in the U.S., second only to Thanksgiving. Need to grab a gluten-free brew to enjoy with these snacks? Download our free gluten-free beer roundup with information on more than 65 gluten-free beers! For healthier gluten-free football snacks, read our list and get ready to enjoy the game! You’ll find veggie pizzas, avocado deviled eggs, kale chips, baked mozzarella sticks and more! If junk food is more your style, check out our Top 10 Gluten-Free Junk Foods for less healthy delicious options. 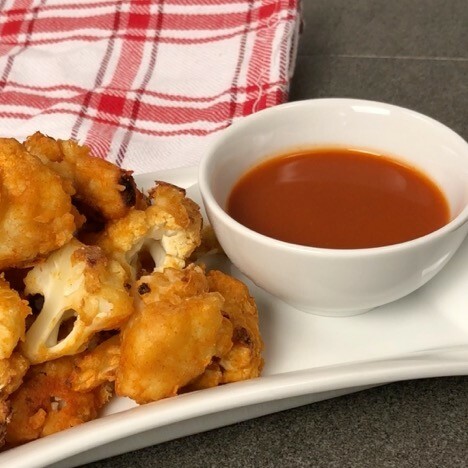 If you have yet to try cauliflower wings, this recipe is a must-try. These “wings” are covered with a gluten-free flour batter to give a delicious crunch with that perfect kick of spice. While others are enjoying deep-fried chicken wings (in fact, more than 1.3 billion wings are expected to be eaten during this weekend), you can get the same crunch and flavor without any of the guilt. Get the recipe.